The relationship between pigs and humans has been a long and intimate one; according to one recent study, it can be traced back more than 10,000 years. And yet, unlike the human interactions with dogs and cats, which people have commonly named, taken into their homes, and welcomed into the family, Pigs have nearly always been left outside, and their relationship with Humans has generally been concluded with a meal. 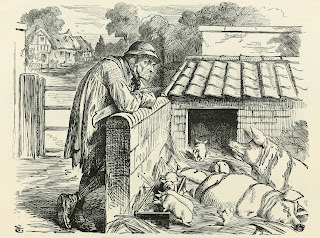 When it comes to Pigs, men have long felt that there was little sense in naming them, as their only moment of Note was most commonly their being served for Supper, and found more flavourful or delicate than their predecessor—every one of them nameless save by such Ephemeral sobriquets as Loin or Roast. in such a realm of infinite and infinitely replaceable Parts, a row of dinners one after another, the idea of naming any one such meal appeared as absurd as naming a toenail-clipping, or a Fart. Now it's not unknown for a particularly favored pig to be kept about, most often for breeding purposes, but the idea of having a Pig within one's house, living as a pet, has never been widespread, though many instances of it are known, even to this day. Miniature pigs have recently become popular, and are doubtless better adapted to the home; many who have taken pigs in have remarked that they are far more intelligent than dogs, and very companionable. All the same, the many millions of pigs who have, throughout history, been raised for food and slaughtered at a year old, vastly outnumbers those who have escaped a visit to the Butcher. Before I came to my calling as Toby's Editor, I will confess that I quite often enjoyed a rasher of bacon, or reached for a ham sandwich for lunch. Even as I was at work on the book, I was never averse to such a snack, and if enjoying a salad, would sprinkle some little crispy bits upon the lettuce. But once the book was complete, I developed a very strong and sudden distaste for pork in any form, a feeling that I did not at first associate with Toby. When, at a celebratory dinner on learning of the book's publication, I accidentally bit into a salad with bacon dressing, I found I had to desist, and discreetly send it off within a napkin. I am not a vegetarian, although as an undergraduate I followed such a diet for some years. I have been known to poke gentle fun at friends who are vegans, followers of macrobiotic diets, or those who insist upon buying what one wag has dubbed "happy meat" -- meat from animals that were, at least until the moment of their demise, roaming freely and contentedly. But now that I have come to know Toby, I find that I really can't eat pork at all -- ever. I do not condemn anyone who would do so -- indeed, in an odd way, I envy them. I will miss the flavor. So much of the ethical universe seems to depend on sympathy, and so much of sympathy depends on our knowing something of the story of the lives our fellow creatures live. When we can, by such tales, gain a sense of fellow-feeling, imbuing an animal with a sense of Self, we quite naturally draw away from the prospect of eating their relatives. If we can know or name, a living thing, we can more readily imagine it as a companion -- whereas the nameless -- the herd, the crop, the multitude -- can be devoured without so much as a hiccup. In L. Frank Baum's Land of Oz, there was a character, the fast friend of the Cowardly Lion, who was known as the Hungry Tiger. The Hungry Tiger would really have loved to have devoured a meal of tender little human babies -- but alas, his conscience prevented it. Thus his earned his name, for he was always hungry. Fortunately, the Land of Oz being a fairy kingdom, he could never starve, and had as pleasant a life in every other respect as Dorothy and her other friends. When I get notes from my friends congratulating me on the new edition of Pyg, and suggesting we celebrate with some BLT's, I feel much as that Tiger did.